Dalea candida Michx. ex Willd. Stems: Erect or widely spreading, 1 to several, slender, straight, simple or sparingly branched above, glabrous, ribbed, sometimes glandular-dotted. Leaves: Alternate, short-stalked or nearly sessile, odd-pinnately compound, .75 to 2.5 inches long, .5 to 1 inch wide; leaflets 5-13, elliptic to oblanceolate, .25 to 1.5 inch long, glabrous, minutely glandular-dotted below; tips usually sharp-pointed. Inflorescences: Spikes, cylindric, 1 to 3 inches long, about 1/2 inch thick, densely flowered, terminal. Flowers: Calyces 5-toothed, 10-ribbed, glabrous or pubescent; corollas papilionaceous, less than 1/4 inch long, white; banner petals erect, larger than wing and keel petals; stamens 5, filaments united. Fruits: Pods, oval, less than 1/5 inch long, glandular, protruding from persistent calyces, 1-seeded. Habitat: Prairies, rocky hillsides, roadsides, waste places, and open, rocky woods. Distribution: Principally east 2/3 of Kansas. 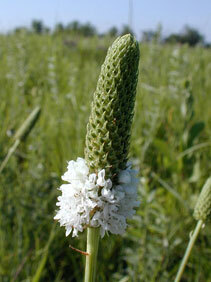 Forage Value: White prairie-clover is readily grazed by livestock and will disappear in overgrazed areas. Uses: Native Americans steeped dried leaves in water to make a tea, used the leaves to create medicine applied to wounds, and chewed the sweet-tasting roots. Comments: The taproot can descend to 6 feet.